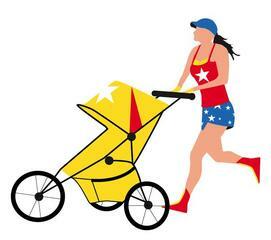 Thanks for subscribing to Inspiring Running Moms. I promised to put together some information on interval training and speed workouts, so I've been busy reading books, talking to runners and coaches, and doing some experimenting on my own. So here's part one of a two-part series on interval training and specifically, speed training. Next month we'll get more into some specific speed training workouts. For now, the benefits of interval training are better results faster - who doesn't want that! ;-) Specific benefits: burn more calories, build more muscle and burn more fat in the long term. Specific benefits to the runner are the ability to run faster, stronger and with more endurance. Whether your goal is to run your fastest 5k or marathon ever or to run a 5k or marathon in the same time but with the use of your legs intact at the finish line, interval training will help you. To read more about interval training, how it works and what it can do for you, click here. OK, here's the thing I'm really excited about. I've been working on it for a while now and I finally spent the last three days working on it solid in order to complete my first draft. I felt like I was back in school working on finals...LOL. As a subscriber of Inspiring Running Moms, you have the first opportunity to try this free home workout plan. It even comes with a free nutrition consultation. Let me know how it works for you. Check it out here. The password is: nancy. And please let me know your thoughts on it, or how it works out for you. Do you sometimes find it hard to muster the energy for a workout? Or you get halfway through your workout and you just feel like you want to go to sleep? The problem might be with what you are eating beforehand. Most of us know to stay hydrated before, during and after our workout, but we also need to pay attention to what we what we eat so that we have enough energy. Some of my personal favorites before a run are oatmeal (I was surprised with that one, I never did like it as a child. But those little packets of instant oatmeal with apple and cinnamon or maple and brown sugar can be quite tasty! ), cheerios with skim milk (or soy milk if dairy bothers you before a run), or a bagel with peanut or almond butter and a banana. These are good meals to take about 1 1/2 hours before you workout, but what if it's time to workout and you still feel hungry. My solution is a Gu brand energy gel. I've started keeping them around and taking one about 10 or 15 minutes before my run and they really help give me energy for the run. Now I take them before any cardio workout. You can find them with or without caffeine here. Natalie is an example of the amazing friendships you can make through running. We met while training for the San Francisco marathon in 2006 and have since become good friends. Natalie has been an inspiration to me in many ways, but especially because of her ability to deal with injuries and setbacks along the way, something we all face...but when she faced these, she used them as an opportunity to become stronger and share the advice she learned to help us. Seeing Natalie overcome her setbacks had helped me overcome my fears of getting injured, and she has also been able to give me some great advice on how to not get injured. I'm confident she will be able to help and inspire you as well. We will look at interval training some more and learn about some specific speed workouts to help you become a better, stronger, faster runner. Since some of us are starting to prepare now for marathons in the fall, I'll pass on some tips on training for your marathon whether it be your first marathon or a personal best you're going for. Here we will work on helping you to accomplish your fitness goals, both for you and your baby, by having a fit, healthy pregnancy. We will offer stories and advice that will help you whether you were very active before your pregnancy or if you are just now starting to think about fitness. Speaking of a fit pregnancy, Crystal ran her first marathon in her first trimester. Now this might not be for everyone, but for her, this was the experience of a lifetime. You will hear her amazing story and I know you will be inspired whether you are thinking about a marathon yourself or you just want to have a fit pregnancy. Have a great story or a tip on running or nutrition? Maybe something you’ve read on running-mom.com has inspired or helped you? Or do you have a question you would like to have answered or a running-mom topic you’d like to see explored? We’d love to hear your feedback and future running-mom.com readers will thank you too! ;-) Contact me or post your story here. We may even publish it (with your permission) on running-mom.com or feature YOU in one of these Inspiring Running Moms Ezines.